Engineers at the Georgia Institute of Technology have developed a collection of new ways to interact with smartwatches that offer more control than a chubby finger. Using LG and Sony watches, the researchers experimented with a number of different control methods, including swipes of the watchband, skin-taps and even breaths. Using the device's gyroscope and accelerometer, PhD student Cheng Zhang developed a technique called WatchOut that uses off-screen taps and scrolling gestures. A demo app lets a user scroll up, down, left and right by swiping on the watchband. He also developed an app that creates touchpoints on the bezel of the display. Rather than scrolling through a list of apps, you assign them instead to different touchpoints. The same points can be used to control incoming calls. 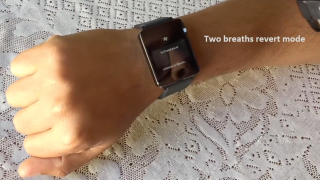 Another team, led by PhD student Gabriel Reyes, created Whoosh - a technique that allows a person to use their breath to control a smartwatch. Using the microphone alongside machine learning systems, Whoosh can recognise blowing, exhaling, shushing, sipping and puffing independently. For example, you could shush your watch to silence an incoming call or blow on it twice to accept. Another idea was to blow on the watch to delete words in a dictated text message, or transfer data by sucking it with your breath from the screen of one device and blowing it onto another. Reyes believes that technique could be especially useful for people with disabilities. "The sip and puff technique has been used to control wheelchairs,” he said. Dingtian Zhang, a PhD student working in the same lab as Reyes, developed a 3D printed "FluteCase" that snaps onto the outside of the watch and contains eight holes of varying lengths. When the wearer blows into them, unique frequencies are generated and passed to the watch's microphone, which can identify the intended target, which is linked to a specific action within different applications. Finally, a project called TapSkin uses the watch's microphone and internal sensors to allow the user to tap on the back of their hand to input numbers or commands. It can detect a total of 11 different tapping locations around the watch. All the projects were presented at various conferences in late 2016.